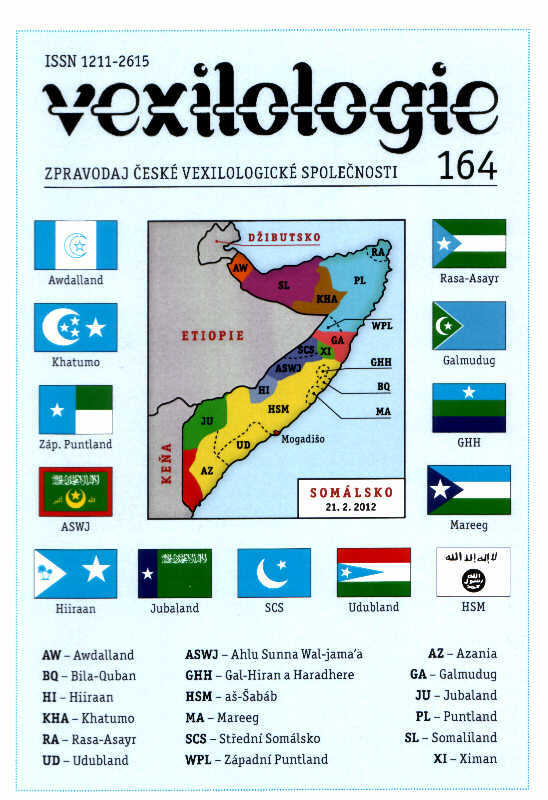 This issue of Vexilologie is dedicated to the well-known Czech vexillologist Zbyšek Svoboda in honour of his 70th birthday which he celebrated on 20 November 2002. 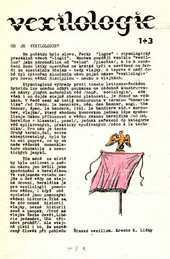 Pavel Fojtík interviewed him on this occasion. 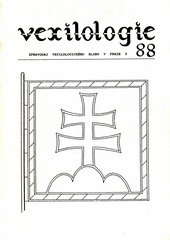 Zbyšek Svoboda remembers events that influenced him in his devotion to the flag study. 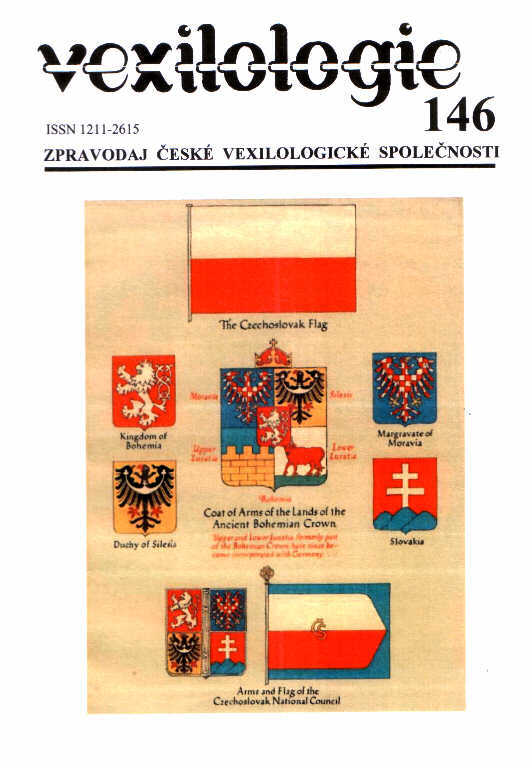 He also mentions his engagement in the Military Museum in Prague where he took care of flags and his career as an expert for vexillology, phaleristics and regalia at court and as a member of the sub-committee for heraldry and vexillology in the Czech Parliament. He describes his favourite flags he designed (the picture shows the flag of Hostomice where he combined white and red stripes with the Czech lion) and his file of cards on each of which he painted a municipal flag to avoid the adoption of the same flag by another Czech municipality. 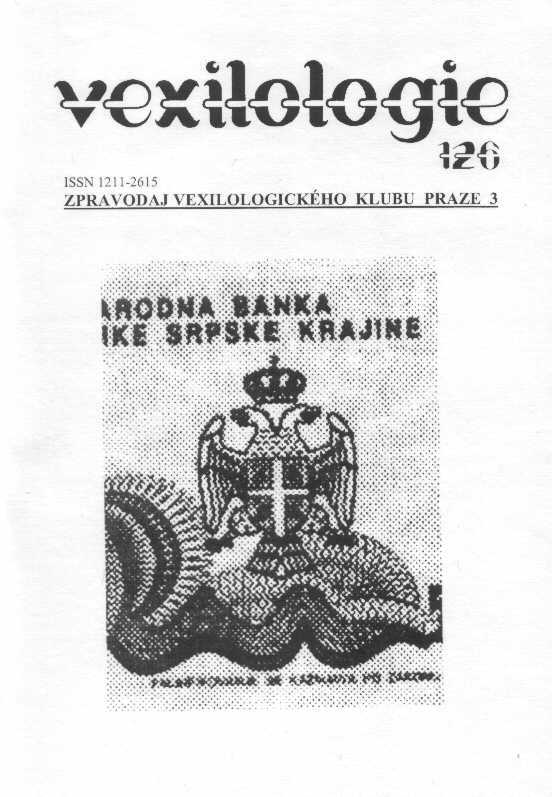 This bibliography compiled by Aleš Brožek records more than 70 books, articles, book reviews and texts to flag plates which Zbyšek Svoboda has written since 1964. 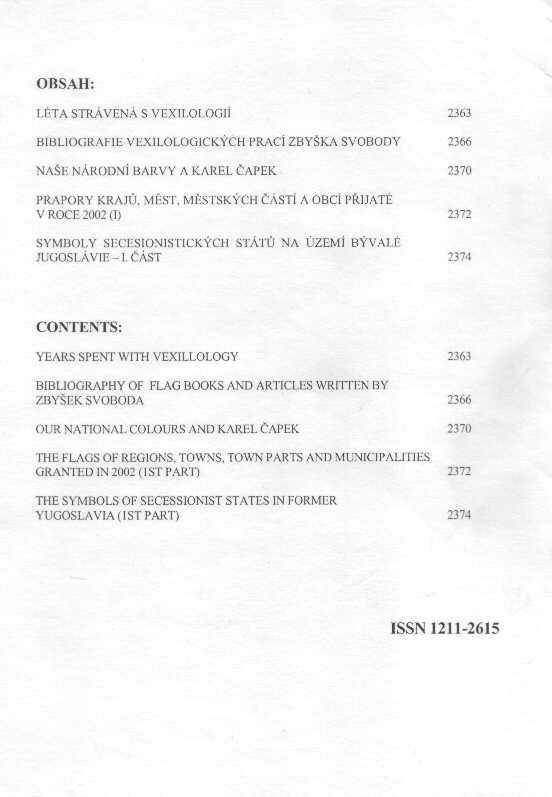 The author Zbyšek Svoboda emphasizes the contribution of the famous Czech writer Karel Čapek to implementation of the white-blue-red tricolour to national symbolism of Czechoslovakia in December 1918, i.e. before an official adoption of national colours in 1920. When the display of old Czech land colours white and red was spread all over new republic and in its armed forces, some rare cases of the use of this tricolour had been recorded in museum collections. And it is Čapek´s poem "Song of the banner" published on 19 December 1918 that refers to the influence of national colours of the United States and France to newly born national symbolism of Czechoslovakia when citing revolutionary anthems Yankee Doodle and Marseillaise, respectively. The adoption of this tricolour in 1920 has expressed not only the Slavic character of a new state but also its sympathy to great Western democracies that deserved well of its establishment.